Although there is much discussion in Rabbinic literature about the fundamental reason for this mitzvah, children will probably best appreciate the idea that this is an example of preventing cruelty to animals (tza’ar ba’alei chayim). Talk to your kids about different ways that we can treat animals with kindness and respect. 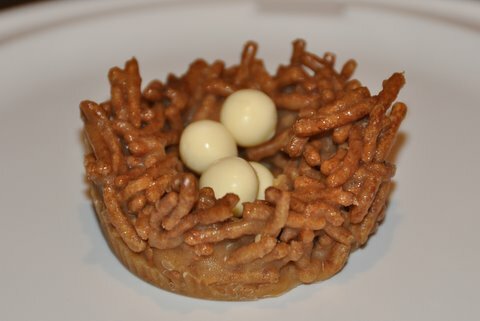 Then, make these fun, easy, and delicious bird’s nest cookies to serve at your Shabbat table this week! 2) Mix the chips and the peanut butter together in a large bowl. 3) Add noodles or sticks to the mixture. 4) Place spoonfuls of the mixture into muffin tins. 5) Make an indentation in the center of each with your finger. 6) Put the cookies in the freezer for one hour. 7) Remove cookies from tin. 8) Place white candies in the center of each cookie and serve! 32: When Life Gives You O.J.